TV and stereos have certainly come a long way in the last decade and with them we have CD and DVD players, hard drives, MySKY boxes, amplifiers, speakers and more… plus of course media storage needs. 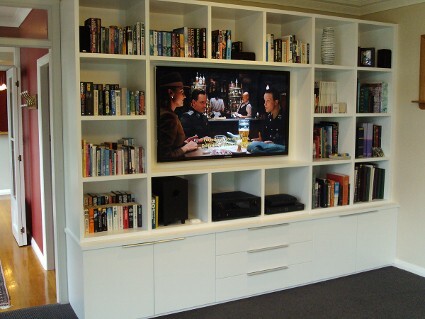 In some homes the entertainment unit or home theatre system is a key feature of a room or even an entire home! Entertainment units can be made of anything from traditional timbers to modern granite; often Melteca laminate or painted custom wood or any combination of these. The main advantage of a custom built unit is that it can be built to fit between the structures in any room and will specifically house your electronic equipment and CD collection. Entertainment units can have drawers, open shelves, glass doors, special lighting… or anything else you can think of!